Do less to get more done really does work. Of course, answers as simple as “just do less” can belie the amount of effort required to implement them — especially in situations as burdensome as overwhelm, feeling incapable of accomplishing anything, and so on. In other words… simple doesn’t mean easy. As we train ourselves to do less so that we can get more done with less overwhelm, we often run into a set of scenarios that provide us particularly tough challenges. One of these challenging situations is especially prevalent in workplace settings, and it’s something that can derail us in all the areas of our life. Do you often feel like you are going nonstop, draining yourself of energy, and yet can’t really pinpoint anything of real significance that was accomplished? Do you seem to be putting out proverbial fires all the time? Are you frequently pulled into a million different directions? Do you feel like you’re constantly dropping the work you’re doing to take care of something else that needs immediate attention? Or, do you feel like you are doing a lot and not getting much done? If you’re like many of us, you answered “yes” to at least one of those questions. As such, let’s explore the concepts of urgency and importance to uncover how we can start saying “no” to those questions. Urgency and importance are like so many hidden in plain sight concepts. We’re aware they are somewhat separate ideas, and yet we still tend to mix them up. We lose track of their significance, and fail to treat them appropriately. 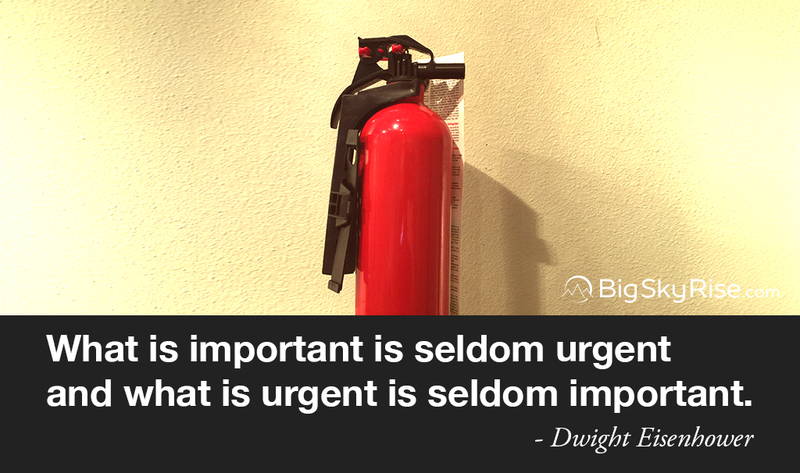 So, what is the difference between urgent and important? Going beyond these dictionary definitions, gives us a better sense of the terms and how their concepts interface with our existence. Urgent essentially means something that demands our immediate attention. Regardless of what is already going on. It wants us to look at it now, and to drop everything else. We engage with urgent tasks since their consequences are immediate and easy to see. The distance to the consequences of non-urgent, important tasks, is far enough though that we often think there aren't any. Urgent tasks tend to knock us off balance and so we usually respond in a reactionary manner. As a result, we act with a narrow focus, losing track of the larger picture. Along with that — and the inherent urge to rush through things — urgent tasks trigger a greater level of stress, defensiveness, and negativity. When we engage with urgent tasks, we get distracted from our true goals and the things that matter to us. Quite a few urgent tasks aren’t truly important, they simply feel that way. Many times urgent issues have been around a long time and someone just noticed them. Urgent tasks are often tied to the goals of others, and frequently appear in the form of: “I just discovered…”, “I need you to do this real quick…”, “Can I interrupt you for a minute…”, etc. Urgent tasks aren’t necessarily hard to solve. However, they often don’t have a huge negative impact if left for a while either. Many urgent matters resolve themselves with time, or become irrelevant at some point. Urgent tasks often exemplify the adage of “death by a thousand cuts. Many times, you can take care of them relatively quickly, however they add up fast. On top of that, each small distraction yields more of a consequence than we might initially recognize. (For example: there’s task switching costs, energy expenditure, loss of thought lines, etc). Important means that it is something which actually matters. It makes a difference in a tangible and useful way, and contributes to the bigger picture. Important tasks touch on our larger goals and purpose and help us maintain a wider, more open perspective. When something is important we tend to approach it more thoughtfully, rationally, and as a result more calmly and well-balanced. That allows us to be more responsive to situations instead of reactionary, which usually leads to better outcomes. Important matters make a difference to us. They lead us to reach our goals. They are affairs which give us a sense of accomplishment when we’re done with them, and a sense of purpose while we work on them. They’re tied to the direction we’d like to be traveling in. Even when we don’t complete them — or aren’t as successful as we wish — we still feel good, knowing that at least we worked on something that mattered. Ultimately though, why do we care about the difference between urgent and important? Simply put, there is a danger of falling into an urgency trap, to losing focus on what’s really important to you, and to living in a reactionary, off-balance state — and then facing all of the consequences that go along with that. You can do a lot of things, yet get nothing done. At least anything that moves you in the direction you wish to go. You become overwhelmed, rushing from emergency to emergency without feeling like you can actually get anything done. More and more emergencies pop up as you lose track of bigger picture tactics and strategies that would help prevent them from arising. You suffer from increased stress and wear since you’re always running in high cortisol, emergency scramble mode. At some point, you get tired. You burn out. The things that matter to you get cast aside and neglected. Many times, as a result of getting caught up in the urgent, people look back and feel they haven’t progressed or accomplished the goals they set. As a result they don't feel they lived the life they wanted. So, how do we deal with urgent and important matters in the most effective way? How do we do the things that actually matter to us, and that make us feel we are doing something worthwhile? Enter the Matrix… the Eisenhower Matrix. In his book, The 7 Habits of Highly Effective People, Stephen Covey took Eisenhower’s Decision Principle and created a decision matrix. This matrix provides a visual and interactive tool for distinguishing between the important, unimportant, urgent, and not urgent. The grid lays out our important/urgent options into four separate quadrants. By placing our tasks in an appropriate quadrant we can determine the form of action each one warrants. The top left — or first — quadrant is the home for the tasks which are important and urgent. These tasks make a difference to your bigger picture, and they also require immediate attention. As such, they are the tasks you should do right now. Barriers and obstacles: any items that block you from progressing on your important goals and need addressing before you can make forward movement. For example, refilling your metro transit card so you can get to your appointment. Communications: For example: an email requesting missing documents when closing the sale on a house, a message about potential fraud on your credit card, or an email for an opportunity that is only available for a short period of time. The top right — or second — quadrant is the area for the tasks which are important and are not urgent. These tasks make a difference to your bigger picture and your broader goals. Unlike quadrant 1 though, they do not require your immediate attention. These tasks may or may not have a deadline. If they do, the deadline is far enough in the future to not feel pressing. We should spend the majority of our time on these tasks, since they are important to us, and because we can approach them in a responsive, considerate, and calm manner. On top of that, these are the tasks which tend to provide a sense of purpose and fulfillment. However, due to our usual behavior patterns and psychological tendencies, we often spend the least time on these tasks. Frequently we don’t really know what is important to us, at least on a very conscious level. This comes partly from the fact that figuring it out is an important, yet not urgent task — the type of task we tend to do the least. Additionally, given the lack of present, immediate, and readily perceivable consequences, we tend to let these non-urgent tasks sit to do “later”. Usually this results in us never getting to them. For the most part, we are predisposed to address the urgent, while taking care of the non-urgent takes willpower and discipline. As a result we tend to get caught up in urgent tasks — both important and unimportant. So, we burn through our energy, and then spend the majority of our remaining time on the non-urgent and unimportant. As such, these are the tasks you should do and schedule; these are the tasks you should consciously and actively engage with. Welcome to one of the more dangerous areas, the bottom left — or third — quadrant. This is the quadrant dedicated to the tasks which are not important and are urgent. These tasks are not truly important to your long-term, broader goals. Yet, they feel pressing and needing of your immediate attention. Most of these urgent and unimportant tasks come in the form of interruptions from others, and involve assisting them with their goals and priorities. Helping others meet their goals and priorities is an important part of being a compassionate and caring individual. The key though is to help in a strategic and considerate way so that you can maximize your ability to help. A requirement of this is to optimize your energy usage, your mental clarity, and your focus, which in large part of this comes from taking action on the items found in quadrant 2. In other words, if you are pushing off the things that important and not urgent, you are not optimizing your ability to help others. Thus you harm them and yourself at the same time. A result of getting caught up in tasks found in quadrant three, we feel like we are doing lots of things each moment and each day. When we take a moment to look though, we realize we haven’t made any progress on the things that matter to us. We’re stuck in roughly the same place as before. Our life passed us by. We’re worn out from expending a lot of energy. We haven’t done all we're capable of. We aren't where we're meant to be. As a result, we're left drained, frustrated, bitter, and resentful towards the people and world around us. Life feels out of our control and unfair. To address this — and to maximize our potential and ability to meaningfully help others — we must learn to spend less time and effort on the urgent and unimportant. As such, we should delegate, delete, decide the importance of, or delay these urgent, unimportant tasks. If possible, have someone do it for you by delegating it. Or, simply don’t do it, giving a considerate and caring “no” in response to the task. Is this actually important in some other way? For example, maybe you don’t help this person much, or they have no real alternative. Is it worth the cost in time, energy, and mental bandwidth? There are always places appropriate for making exceptions to things like productivity guidelines. Additionally, see if it is possible to delay addressing it. Doing so means you can approach it in a calmer, more considerate manner, and at a time that doesn’t interfere with the bigger picture. For example, you can usually delay unimportant and urgent emails for a while. Then address them at a time set aside specifically to deal with such matters. Quadrant three also includes another subcategory of tasks. These are items which may be important to you in the sense that they need to be done. Yet, they are also not important because you don't need to be the one to do them. What and how you delegate depends on the activities you’re doing, the position you’re in, and the resources you have at your disposal. No matter what, be sure to fully consider your options before dismissing the idea of delegation. The bottom right — or fourth — quadrant is one filled with tasks which are not important and are not urgent. These tasks don’t make a difference to your bigger picture nor your broader goals. They also do not require your immediate attention. As such, they are the tasks you should delete – i.e. Don’t do these. We may think we naturally won't take these tasks on since we know they are unimportant and not urgent. However, with a little consideration, it becomes clear we actually do spend a fair amount of time doing activities that fall in this box. Some of this comes about because other people want you to take on one of these tasks. Even though their requests don't need immediate action, nor are they important, we often have a hard time saying “no”. For these situations, a good approach is to communicate your bigger objectives and boundaries ahead of time. When you do this, people are less likely to ask in the first place. Along with those occurrences, mindless time-wasting activities make up most of this category. We fall into doing these activities for a number of reasons. Some reasons are cultural, where social norms indicate that’s what we’re supposed to do with our time — e.g. watch TV after getting home from work. Other times we do things — such as scrolling endlessly through Facebook — since we burned through our energy and willpower dealing with interruptions and urgent tasks. Additionally, we often lose our sense of awareness and unwittingly let time waste away. Scrolling through social media feeds like Facebook, Twitter, etc. Aimlessly surfing the web and reading comments on sites like Reddit or Youtube. Shopping online without a specific aim. While it’s not imperative to entirely eliminate these types of activities, it’s very helpful to reduce them as much as possible. Unfortunately, many of us suffer from the belief that these activities are essential for relaxing and decompressing. In reality though, there are significantly better options for relaxing, decompressing, and restoring ourselves. While this is a bigger topic for another time, the basic lesson is that you are better off spending the 2 hours at a spa, sleeping, soaking in the tub, reading fiction, doing yoga, etc than scrolling through Twitter. In fact, doing things to fully relax, refresh, and rejuvenate you is something that belongs to quadrant two of the matrix. Along with knowing the basics, you can get even more out of the Eisenhower Matrix with some useful strategies and tips. As you encounter various tasks and situations take an extra moment to ensure you don’t get misled. There are many times when something comes to you that looks urgent, feels urgent, and is labelled urgent, when in reality it isn’t. This false sense of urgency is quite deceptive — though usually not done maliciously or deliberately. Is this really urgent, or does it only appear that way? What will happen if I don’t address it immediately? By observing with a calm, clear perspective, you see these tasks don't belong in the urgent category, and place them elsewhere. Am I doing this because it is important, or is it because it feels urgent? Does this activity help get me that goal? What am I really working towards here? Does engaging in this truly reflect and manifest my deep-seated values, beliefs, and purpose? These questions help you reflect on what’s important to you and whether a task fits with that. At the same time, when a task appears to be unimportant, apply a moment of awareness and reflection to it to ensure you don’t overlook an important aspect. There are times that even if a task is “unimportant” to you, expending some time to help is worth it. For example, if you haven’t helped a friend with anything for a long time — or if a task is deeply important to them — by helping, you work towards the goal of being a better friend. There is a balance of when to say “no” and when to say “yes”. Be conscious of where that balance is so as not to tip it too far in either direction. Saying “yes” too much is counterproductive for everyone. Saying “no” too frequently harms relationships and ultimately yourself. Look useful? Get the “Do what’s important with the Eisenhower Matrix pocket guide”. You can get more done by doing less. Doing less is simple, though often not easy, and we run into numerous hurdles as we train ourselves to stop being too busy all the time. One of the hurdles we encounter is dealing with “urgent” matters. Urgent matters and important matters are often not the same though. So, dropping the important things you are doing to address something urgent is usually counterproductive in the bigger picture. When something urgent appears, approach it calmly and mindfully. Determine if it is really important, or something you should ignore — at least for that moment. 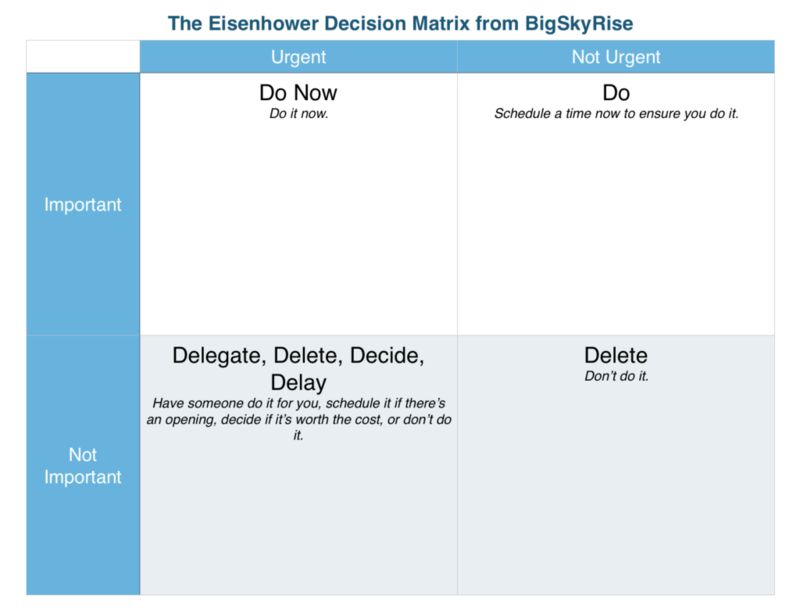 From there, utilize tools such as the Eisenhower Matrix to make your action decisions more clear cut. Regardless of what you’re taking on, be it personal development, improving time management, maintaining greater energy levels, or just looking to focus more on what matters, the Eisenhower Matrix is a useful tool. Urgent matters don’t always require immediate action. Urgency doesn’t connote importance. While something can be urgent, it doesn’t mean it’s necessarily important, or worthy of taking your attention away from other focuses. Matters that are purely urgent often become irrelevant or resolve themselves with a bit of time, and don’t carry big consequences. Approach urgent matters with a calm mind and clear focus. Determine whether they are really important, or have significant consequences before dropping other things to resolve them. In general, set aside the urgent unless it’s also important. Use the Eisenhower Matrix to help you prioritize. Interestingly enough, this conflict between urgent and important plays out in our thoughts and minds as well. As you become more aware through your mindfulness practices, note how urgency and importance play out inside your head. While I’ve read and come across numerous discussions around the Eisenhower matrix and urgency vs importance, the two that stuck out most prominently in my mind come from James Clear and Brett McKay. Their articles inspired this post to grow beyond its original scope, and both of these people share many things worth reading.